We have an official state rock, state flower and state tree. Now a state Representative wants an official state pet. 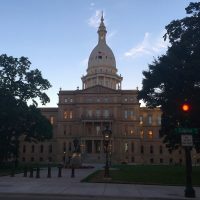 Troy Democrat Padma Kuppa has introduced legislation that would designate shelter pets as the official state pet of Michigan. She introduced the bill yesterday, which was National Pet Day. Kuppa says recognizing shelter pets as Michigan’s state pet will not only raise awareness of animals in need, but will also serve as an example to the rest of the nation that Michiganders don’t just care about the people of our state, but about the well-being of our most loyal companions. Ohio, Illinois, Colorado and California are among the states that have designated shelter and rescue animals as their official state pet.